SHOOTING THE SHIZNIT : RassleResults: MCW Luxora, AR 3.06.10 - 517 pack the building!! RassleResults: MCW Luxora, AR 3.06.10 - 517 pack the building!! 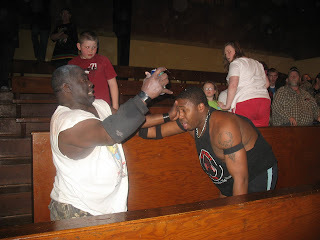 The 5th match ended with Frankie Tucker getting a dq win over Bishop due to outside interference from Vman and Officer Hudson.. Koko Ware and Big Daddy Lafonce made the save setting up a main event match for the mcw tag titles. The champions the Vman and Hudson defending against Koko and Big Daddy......Koko and Big Daddy ended up winning by dq as Rashard interfered and called out the heel dressing room and they beat down Koko and Big Daddy until the faces came and evened things up.